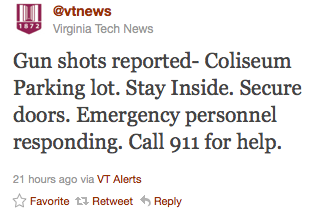 Virginia Tech, apparently, earned a graduate degree in crisis communications in the four years since the tragic 2007 shootings. When shots were fired on campus yesterday, campus officials used text message alerts, even Twitter, to keep their community and the public at-large informed. One simple message, sent minutes (not hours) after initial reports of a gunman loose on campus --and several timely updates later-- informed students and staff to simply stay indoors. After receiving a failing grade during the previous campus tragedy, VT went high tech, installing a outbound text alert system amplifying the message from the administration offices to personal cell phones in pockets across the community. Such systems are becoming commonplace in universities, hospitals, even municipalities around the world. One local school campus installed a similar program to notify students in a variety of emergency situations with instant updates in the aftermath of the VT shootings. If you have a son or daughter in school, yesterday's news from VT should serve as a reminder to check the contact information on file with your campus. Alerts are useless if sent an old or incorrect phone number. While no one technology is foolproof, even in the best of circumstances. Outages, errors, even dead batteries can thwart complex systems when they're needed most. Think about your own, personal, communications plan: What will you do when the next emergency hits?